What is the right way to brush your teeth? You know how important it is to brush your teeth on a daily basis. But did you know that there is a right way to brush and a wrong way to brush? And if you’re not brushing the right way, you’re not caring for your teeth as carefully as you expect. Follow this simple step-by-step guide to ensure your teeth, gums, and smile are as healthy as they possibly can be. Step #1: Purchase a toothbrush that has soft nylon bristles, fits comfortably into your hand, and has a small enough head to reach all of your teeth. Avoid brushes with “natural” bristles because they can harbor bacteria. Step #2: If your current toothbrush is old and worn out, replace it. A good rule of thumb is to automatically replace a toothbrush after four months. Step #3: Always use a toothpaste with fluoride in it. Fluoride helps to clean your teeth and strengthen your enamel at the same time. If you have additional preferences, find the toothpaste that best suits you. Step #4: Floss before you brush to remove any food from the cracks in your teeth and to open up space for the brush and paste to clean. Step # 5: Squeeze out an amount of toothpaste about the size of a pea. Using too much paste creates a lot of extra suds which encourages you to spit and finish too early. Step #6: Place the bristles at a 45-degree angle to your gum line. Brush upwards or in a circular motion but not side to side. Step #7: Spend at least three minutes brushing. It helps to divide your mouth into quadrants and spend an equal amount of time on each one. That way you don’t miss any spots. Step #8: Be sure to brush the tops and the backs of your teeth as well as the front. Brush the tongue, too, just don’t push too hard, or you risk damaging the tissue. 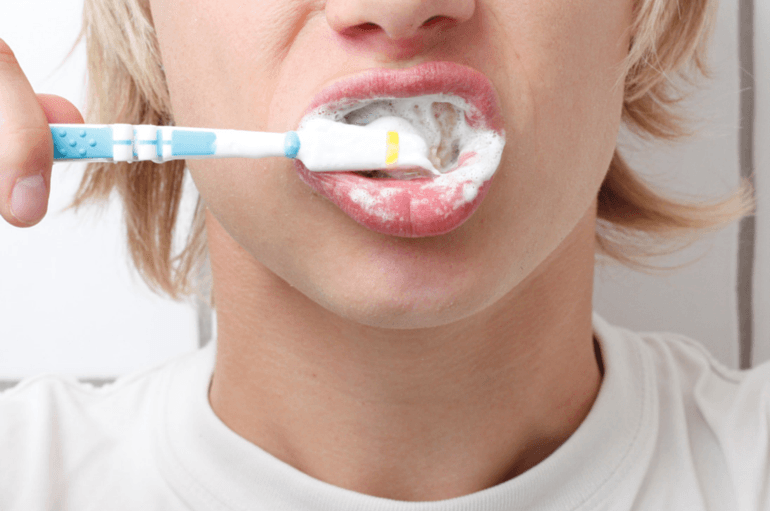 Step #9: Rinse your mouth out thoroughly after brushing. Step #10: Rinse your toothbrush off and store it with the head standing up. Step #11: At this point, you can rinse with mouthwash if you choose, but it’s not essential. Step #12: Repeat this process at least twice a day as close to the end of meal times as possible. Follow these steps for a few days and they will quickly become second nature. Just remember that brushing and flossing alone are not enough to keep cavities, gum disease, and other oral issues at bay. You also need to meet regularly with your dentist in Fresno Dr Donan for a cleaning and checkup. You can make an appointment for a dental cleaning calling to 555 222-9923.